Spark plug HOLA consists of metal body, fixed insulator, contact rod, center and ground electrodes. Interference-suppression resistor is situated between contact rod and center electrode. Electrodes are made of nickel alloy with copper core, which increases the heat removing and improves spark plug thermo elasticity. There are paddings of refractory metal (platinum, iridium) in spark gap on center or both electrodes of several spark plugs, which are resistant to electrochemical erosion, that extends operating life of spark plugs by several times. 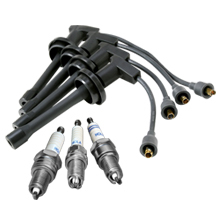 Ignition leads are made of electric conductor, insulator and metal connector, closed with caps.